Dec. 8, 1998: Residents of the far north who saw a massive display of the aurora borealis in late September were also staring through an invisible fountain of gas being accelerated into space by a powerful bubble of solar wind, which pumped about 200 gigawatts of electrical power into the Earth. At the same time, a special space weather research satellite was taking measurements showing that solar events can directly affect our outer atmosphere. "This is the first time we've been able to correlate these solar coronal mass ejections (CMEs) with enhanced ion outflows from the upper ionosphere," said Dr. James Spann of NASA's Marshall Space Flight Center. Spann is a co-investigator on the Ultraviolet Imager, one of two instruments aboard the Polar spacecraft that measured the effects of the CME as it arrived at the Earth. Today, results from those observations will be announced at the American Geophysical Union's annual west coast conference in San Francisco. They will be discussed in a special session, Thirty Years of Ionospheric Outflow: Causes and Consequences, chaired by Dr. Thomas Moore of NASA's Goddard Space Flight Center and formerly chief of the space plasma physics branch at NASA/Marshall. In the early 1980s, scientists at NASA/Marshall, using an instrument aboard the Dynamics Explorer-1 (DE-1) satellite, discovered that the upper ionosphere is heated by electrical currents to form a "polar plasma fountain" of oxygen and hydrogen ions. Follow-on studies by the Thermal Ion Dynamics Experiment (TIDE) aboard the Polar spacecraft, launched in 1995, have shown that the fountain rises higher than the DE-1 could measure. Indeed, the evidence is building that Earth's magnetotail is filled with ions not from the solar wind but accelerated upward from Earth's own atmosphere. Polar is one of several geoscience spacecraft launched by NASA and other nations in a coordinated effort to study space weather - geomagnetic substorms and other events - in the space environment around Earth. Polar's Ultraviolet Imager (UVI), on which Spann works, uses unique filters to take pictures of the aurora borealis - even during daylight. The brightness of these images can be translated directly into how much energy is being pumped into the ionosphere, the ionized top layer of the atmosphere. TIDE, for which Moore is the principal investigator, measures how many ions are around the spacecraft, and their direction and speed. Because sunlight electrically charges the spacecraft so it repels the low-energy ions, TIDE has to use a small plasma gun to neutralize the spacecraft's charge. That is done infrequently because it also disrupts other instruments. On Sept. 23, though, nature and NASA's planners were on the same schedule. On Sept. 22, the sun belched forth a CME, a roiling bubble of plasma (electrified gases) that sailed along with the solar wind on a collision course with Earth. TIDE's plasma gun already had been scheduled to be operating, and Polar's orbital position was above the northern hemisphere, when the CME arrived. "The amount of upwelling ions is a function of solar wind pressure or activity," Spann said. So when the CME hit, it squeezed Earth's magnetic field, squirting particles stored in the magnetotail up the field lines towards the Earth's poles. As UVI showed an explosion in auroral brightness, TIDE measured a significant increase in oxygen and hydrogen ions rising from the Earth. "What we are finding is that the magnetosphere, the space environment within Earth's magnetic field, is usually indirectly driven," Spann said. "When that energy is released and it rushes forward there is a time delay. 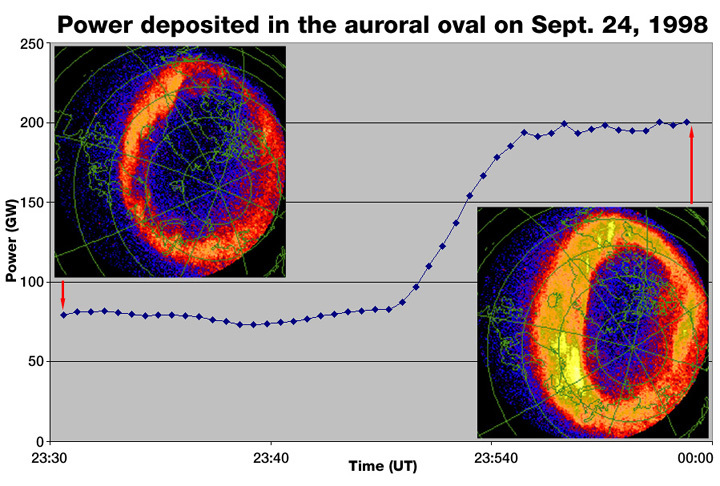 However, "with these large pressure pulses from CMEs, we are seeing the magnetosphere respond practically instantly. It's like you hit it with a bat. Everything rings at the same time." But when the CME arrived on Sept. 24, the pressure jumped to 10 nanopascals. With direct cause-and-effect evidence in hand, Spann is looking through earlier UVI images. "January 1997 was the first big CME event that we saw," Spann said. "There have probably been three or four since then when UVI was in position to observe when the shock arrived." Above, right: An artist's concept shows the Earth at the center of a vast and complex sea of charged and magnetic particles, called the magnetosphere. 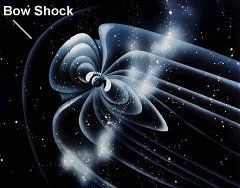 The sun constantly bombards the magnetosphere with the solar wind; the shield-shaped area where the solar wind collides with the Earth's magnetosphere is called the "bow shock." Unfortunately, TIDE's plasma gun was not turned on during those events. But, the September 1998 event will allow Spann and his colleagues to look for common features and gain more insight into how the solar wind, and blasts like CMEs, affect the Earth. Their curiosity is more than academic. "Normal values for power dissipated auroral substorms are on the gigawatt levels," Spann explained, "enough to run a large city for several days." The energy can be calculated from the intensity of the light from the aurora borealis. On Sept. 24, a modest amount of power - roughly 80 gigawatts - flowed in during several smaller substorms preceding the main event which pumped 200 GW. Sign up and receive a mail message when we post a new story! Ultraviolet Imager home page describes how the instrument works and the science it produces. The energy connects into the rocks in the ground and into electrical power grids, long-distance phone lines, petroleum pipelines, and other manmade objects. A modest substorm can disrupt communications and make utility operators a little grayer. A major pipeline fire in the USSR in the 1990s may have been caused by galvanic erosion from solar storms. A major storm blacked out the Canadian and American Northeast in 1989. Nothing can be done to shield the Earth itself from space storms. But a better understanding of how the energy is funneled our way will help in alerting operators on the ground to protect equipment. AGU Abstract: Thirty Years of Ionospheric Outflow: Causes and Consequences. 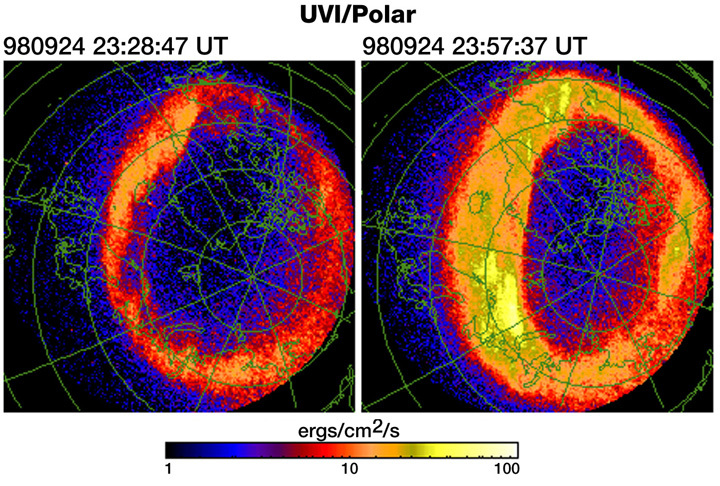 On the 30th anniversary of the first quantitative descriptions of the light ion polar wind and after 30 years of observing terrestrial ionospheric outflows it is fitting that our understanding of these flows and their consequences in planetary magnetospheres should be assessed. That the solar wind wake of magnetized planets indeed imposes a vacuum boundary condition on their polar ionospheres, leading to a supersonic plasma enhancement of Jeans' atmospheric escape, and that solar wind energy is dissipated as heat in the auroral ionosphere, locally increasing the escaping mass flux of plasma (and inevitably, fast neutral atoms, though these have not been observed to date) are known. The composition and mass density of magnetospheric plasmas vary widely over the range of solar and magnetospheric activity and are in some storms dominated by heavy ions. However, what solar wind characteristics control the mass flux supplied by the ionosphere, and how do they control it? Some plasma and all fast atoms are permanently lost from the ionosphere to the downstream solar wind while much of the plasma outflow is recirculated through the magnetotail neutral sheet and accelerated to form energetic plasmas. Neutral gas escape produces a geocoronal charge exchange medium that has been found to be a useful means of imaging the energetic ion populations. However, what are the consequences of varying ionospheric outflows in magnetospheric dynamical behavior? Observational studies and theoretical models are solicited that assess the enhancement of escaping plasma mass flux and the resultant internal source of magnetospheric plasmas. Work addressing the effects of ionospheric plasma participation in storm dynamics is especially welcome. Conveners: T. E. Moore, NASA Goddard Space Flight Center, Code 692, Greenbelt, MD 20771 and J. L. Horwitz, Department of Physics, University of Alabama in Huntsville, Huntsville, AL 35899. Additional information on the conference is available from the American Geophysical Union. Pressure is measured in newtons per square meters, N / m2; this is known as a pascal, Pa.
A nanopascal is a billionth of a Pascal, approximately 10-14 atmospheric pressure!